Luton boss John Still hailed his side’s ‘first class’ performance as they made it three wins on the bounce with a 3-1 victory at Morecambe on Tuesday night. 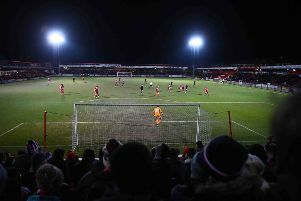 Goals from Luke Wilkinson, Cameron McGeehan and Jonathan Smith were enough for the Hatters to triumph at the Globe Arena as Still said: “I’m really pleased as I thought we played really well. We’re getting stronger, we’re getting better, the discipline is more in our game now. “I’m disappointed with the goal (conceded), Scott Griffiths should have done better, but away from home, Tuesday night, that’s a great performance. Prior to the match, Still had spoken of just how difficult an encounter it would be at a ground where Luton had been humbled 3-0 last season. However, the visitors were on the front foot from the word go and defended valiantly when called up on, particularly in the second period as they look a different animal to earlier in the campaign. The boss continued: “I think we’re getting better, we know we’ve got ability, and we know that we’re fit as. “The power part of our game, that takes a while to come, that’s why we train so hard in pre-season, and that’s why it takes so long. “The rest is organisation and discipline and we work really hard on it. It’s important because we said at half time they’ll come at us, but stay strong. “They scored the offside goal, but other than that, they never really threatened and I just felt that for me, we controlled the game. The result saw Hatters start to emulate last season’s unbeaten run that saw Still’s side shoot up to the summit as the boss reiterated his lack of concern by a slow beginning to the campaign, particularly with an improved goal threat this term. Luton are now the top goalscorers on their travels this year with 11 already netted, compared to a meagre 17 last term. Still added: “Was it any more disappointing than last year or the year before? “We’ve had eight, nine and 10 points in my seasons here and I always say, my team start slow. In the end, I get sick of saying it because my teams start slow. “Did it surprise me? No, I can only tell you what my teams do. We train for a season and we’re not sharp at the start, we’re not, but we get sharp. “We have goals in the team, more goals in the team than last year, all over the pitch.